The output of IC 555 goes high when its Trigger pin 2 is below 1/3 Vcc. An NTC Thermister is used to set this voltage. Resistance of NTC Thermister reduces when the temperature increases. So let us see what happens. VR1 is adjusted to give more than 1/3 Vcc to the trigger pin2. 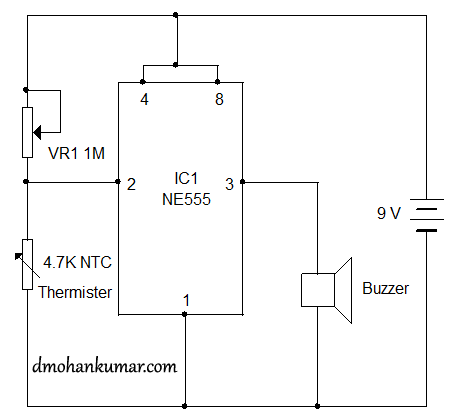 NTC Thermister also has resistance of 4.7K at normal temperature. So the output of IC remains low. When the temperature increases, resistance of Thermister drops, the trigger pin goes below 1/3 Vcc , output of IC turns high and buzzer beeps. wonderful sir! and one more idea… most of the devices are heat sensitive and some of the transistors like the olden days AC128 are light sensitive too (when their capsule is opened). It was discussed in EFY mag. some 20 years back. I just want to remind our readers about this. All of the DC motors used in tape recorders produce electricity when manually turned… like that we can try reversing some of the components.